Welcome to our brand new website, another job ticked off the to-do list for this coming year! Thank you to Barry and Christine Isaacs of WesternWeb, who we think have done an amazing job with interpreting our ideas and commuting them to our new Badgers Sett Holiday Cottages site. The beautiful scenery surrounding Badgers Sett and this pretty 'fairy tale glade' has been enhanced by glistening, crisp snow this week. 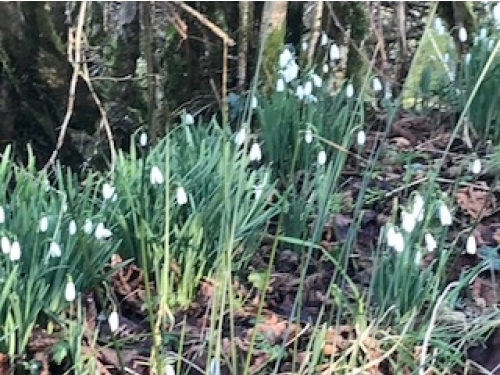 Despite the cold we are seeing encouraging signs of spring in the garden and local lanes. The abundance of daffodils, snowdrops and primroses are starting to peep through and burst into flower - what a lovely sight to behold! There are plenty of opportunities to wrap up warm and take a walk in the sunshine through the spectacular Golitha Falls, Siblyback lake or the footpath running through Badgers Sett and the surrounding area. We are truly spoilt for choice here and early spring is also a fantastic time to get out and explore the gorgeous Draynes valley. After an energetic walk with the family pet dog there is nothing better than returning to a warm and cosy 'Wood Burning Stove' due to be installed in the Thyme and Lavender Cottages - watch this space! Rosemary Cottage is currently having a new stylish bathroom suite installed, with a large Walk in Shower, bright light accessories, along with a new ceramic floor in earthen shades and soft oh so fluffy bath towels, giving a Mediterranean look to this lovely relaxing haven. There will certainly be lots of new additions and upgrades this Year, with photos of these to follow soon on our website, but the true essence of Badgers Sett will not change, this is being carefully preserved and will hopefully shine through for Years to come. We have also retained the 'Visit England Four Star Gold Award' for 2018, for all three cottages, of which we are both incredibly proud ! We are looking forward to welcoming both returning guests and new to Badgers Sett this Year. Julie (other half of owner) !